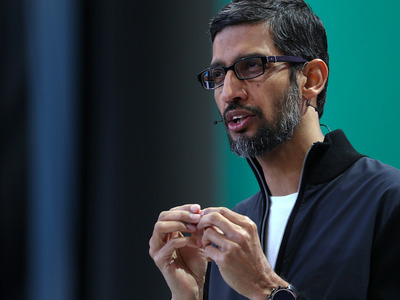 Justin Sullivan / Getty StaffGoogle CEO Sundar Pichai. Appsperiments are new apps that use some of Google’s experimental technologies. The company is releasing three new apps today, on both Android and Apple’s iOS. Google is launching three new experimental apps, named Storyboard, Selfissimo!, and Scrubbies, on iOS and Android (we first saw the news via The Verge). The first will come just to Android, while Scrubbies is an iOS exclusive; Selfissimo!, on the other hand, will be released on both platforms. The three apps are parts of a first round of products inside the Google’s new, so-called “appsperiment” program. More apps will come, but the current lineup focuses on photography. The apps are all built on experimental technologies – a bit like Motion Still, the iOS app that transforms Apple’s Live Photos into universally shareable gifs. “[The apps] rely on object recognition, person segmentation, stylization algorithms, efficient image encoding and decoding technologies, and perhaps most importantly, fun!” reads Google’s blog post. Storyboard is a nifty app that asks users to upload a video, and then automatically extrapolates six frames out of the clip from which it creates a comic-book like panel. There are six visual styles, Google says, and up to 1.6 trillion different combinations for its algorithms to churn out. Scrubbies, iOS’ exclusive apps, lets you use your fingers to scroll through a video’s timeline, DJ style, and record the movement to create a video loop that emphasises movement and action. Discover & share this Animated GIF with everyone you know. GIPHYis how you search, share, discover, and create GIFs. The weirdly named Selfissimo! will make its way to the iPhone and Android phones, and is the simplest app out of this first appsperiments’ wave. A simple tap on the screen will make your phone start recording (with the front-facing camera), and ask you to strike a few different poses. The end result is a lot like a photobooth’s, with Google’s app snapping a shot every time you move and giving you back black and white pictures to save and share on social media or elsewhere.